Safety is the first and foremost thought in everything The Great Lakes Construction Co. does. It is our first core value and our first goal stated on our Corporate Mission Statement. We value construction safety as a core behavior, valuing our employees' safety not only at work, but also at home. No task is ever started without taking the time to analyze safety concerns. This process is carried to the home environment where family is integrated in the safety process. Our symbol of the safety triangle is visibly posted on every piece of equipment, hardhat and paperwork and serves as a reminder that safety is paramount and is the corner stone of our company. We are committed to providing a safe and healthful workplace for our employees and their families. Everyone at Great Lakes firmly believes and upholds the Zero Accident and Zero Injury philosophy within our company, believing that every accident and injury is Preventable. Furthermore, we will strive to successfully embed this philosophy with each of our families, owners, subcontractors and others that may work with The Great Lakes Construction Co.
Construction Safety is deeply embedded in the cornerstone of Great Lakes Construction's philosophy and will continue to grow. The Great Lakes Construction Co. does not just preach safety. We live it. This is self evident as a recognized OSHA Elite Contractor, 3 time national award winner, and a VPP Challenge graduate while carrying an incident rate far below the national average. Click here to view our awards and achievments. We would welcome the opportunity to provide proposals for projects you are undertaking. Please contact Bill Hocevar by phone at (330) 220-3917 or email bhocevar@GreatLakesWay.com to discuss your specific needs and our safety policy. In our quest for ZERO incidents, Great Lakes Construction has enrolled into and completed the OSHA VPP Challenge Pilot Program. This program enhances our safety culture and philosophy through management leadership, worksite analysis, hazard prevention and control, and safety health and training. Working together, we can educate our employees to eliminate worksite hazards and reach our goal of ZERO incidents. 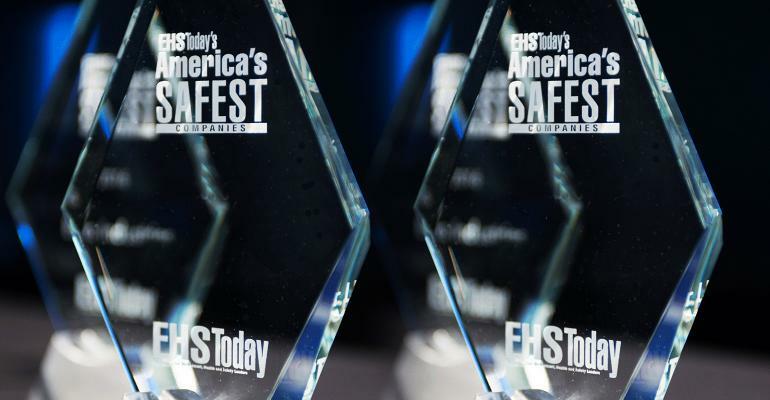 The Great Lakes Construction Co. has been named one of America’s Safest Companies for 2018 by EHS Today, the magazine for environment, health and safety leaders. 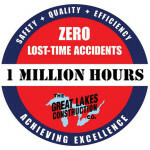 Great Lakes Construction recently celebrated one million hours without a lost time injury! This is a major milestone for us, and a true display of the dedication of our most valuable resource – OUR EMPLOYEES. Our safety success is not accomplished solely from our policies and procedures, but from the follow-through of our talented, trained, and experienced workforce. Our management team is fully committed to our program, which is administered by a staff of four, and carried out through our project superintendents to all of our field personnel. Each day, each task, our crews huddle together to discuss all existing and potential hazards that may arise, and how they will eliminate or control those hazards prior to going to work. GLOSS (Great Lakes Operating Standards System) is our quality management system. This system is a confirmation that all resources, assets, and processes are aligned and optimized to ensure operational excellence.